Whether starting a community or looking for one to join, identifying your priorities, your approaches to life, and your ranges of tolerance can be essential to successful community living. The FIC offers diverse ways of finding a community. 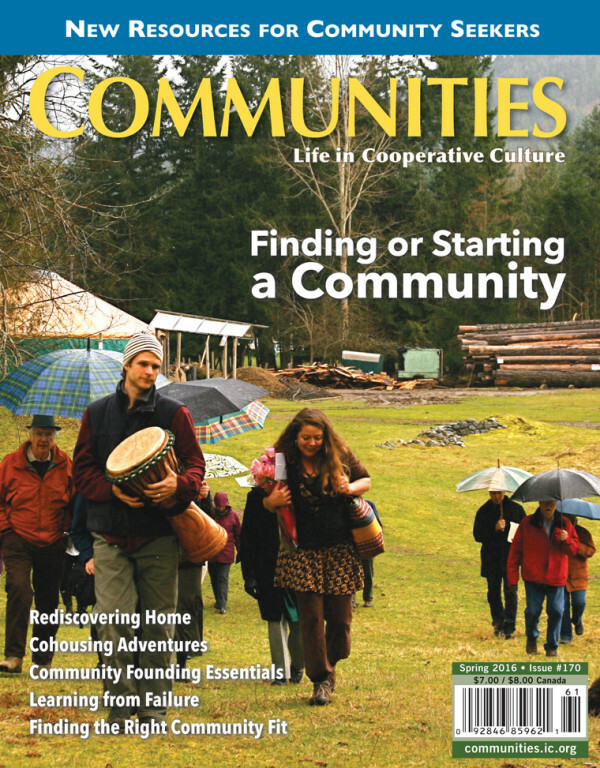 The 7th print edition of Communities Directory rolls off the press this spring, thanks in part to FIC’s newest staff member. A community/solo journey through London, Greece, Oregon, India, Cyprus, and New Zealand reveals as many lessons within as without. A cohouser offers resources and tips on how to find your community. Some creative solutions are starting to counteract cohousing’s demographic homogeneity, but significant obstacles remain. The tension between idealism and compromise plays itself out in the complex communal landscape of Israel. Public art, the Transition Movement, chai talks, and a meetup group all form part of a journey toward community. The co-director of Maitreya Mountain Village suggests others not follow his example. Eco-communities in Britain yield valuable lessons about how to improve chances for success. An Earthaven founder offers perspectives after 21 years of watching the ecovillage unfold. The sometimes triumphant, sometimes traumatic experiences of the three Common Fire communities yield wisdom relevant to anyone working to create a community. Five crucial ingredients make community work; the lack of any one of them can cause it to falter. In the face of challenges, key decisions and actions help Connecticut’s first cohousing community to come together. Two families leave a thriving cohousing community to follow their shared dreams as a tight-knit intergenerational group. Is it crazy to purchase and move into a new house with your grown children and their children? Actually, no. Living communally with family has some big advantages. Two “burning souls” work to bring their dream—a caring community of LGBTs, friends, and allies aging in place as good neighbors—into reality. After a health crisis precipitates major life changes, a couple finds a new path, becoming founding members of a cohousing community. The octogenarian founder of Lake Village Homestead shares insights from a lifelong community journey. A greenspace in the heart of Atlanta embodies the visions of the neighbors who created it. As an activist group matures, the circles of collaboration expand. ← How do we work towards a common goal?